We are pleased to announce the fifth FIFA 19 event of the season hosted by PGL which will take place between May 18-19: PGL FIFA 19 Masters Bucharest. As part of EA SPORTS™ FIFA 19 Global Series, this tournament represents the last Licensed Qualifying Event of the season and another important moment for players to earn valuable FIFA 19 Global Series Ranking Points on the Road to the 2019 FIFA eWorld CupTM. 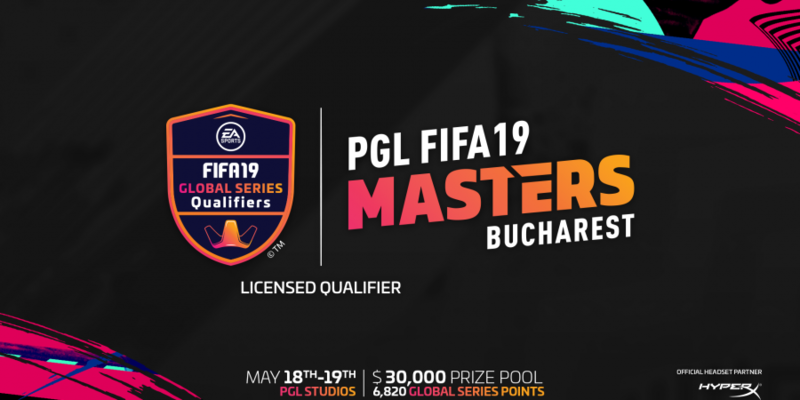 PGL FIFA 19 Masters Bucharest will have a total prize pool consisting of $30,000 and 6,820 EA SPORTS FIFA 19 Global Series Points. 32 players, 16 on PS4 and 16 on Xbox, will participate in the event which will take place in the PGL Studios in Bucharest. We are proud to host our fifth FIFA 19 event, after FUT Champions Cup November, PGL FIFA 19 Cup Bucharest, FUT Champions Cup January and FUT Champions Cup March Singapore. We are honoured to look back at so many memorable moments which happened during these events for the global community of FIFA fans. More information regarding this event, such as the participating players, schedule and talent line-up, will be released in the coming days.